Do you like using mother of pearl buttons in your work? I love them, especially the small ones. Did you know that Handmade Happiness stocks old buttons like these? Penny Baker has put them into packs. 30 smaller ones or 20 larger ones for just £3 a pack. Yesterday I talked about workshops in Handmade Happiness. Suggesting I'll run the workshops every day the shop is open was a bit hasty. I will be led by demand. Today I'll mention another idea and see what the response is. I like the idea of the American quilting bee. Women (or men) sitting round the table working on a joint project. Traditionally it would be on a wedding quilt. I'm not suggesting quilting. 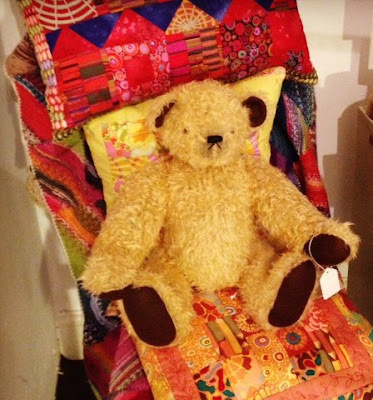 I'm suggesting that anyone who wants to make in the company of others can draw up a chair round the table in Handmade Happiness and work on their own items while sharing the chat and the tea and biscuits. We can talk about the possibility of a joint project for the future. Wednesday afternoons would be a good time for me. Sorry but no unaccompanied children. The shop re-opens this Wednesday January 2nd. 10-5. Would you like to create a collage picture for your wall? Would you like to knit and/or crochet yourself a purse or bag using 'free-knitting' techniques? These are the workshops I've decided to host at Handmade Happiness in January and February. Each will be 2 hours long and cost £10 each for a maximum of 5 people. I'm also hoping to have a talented watercolour artist giving classes at the shop. I'll confirm that later. The workshops will run from 10 to 12 and from 2 to 4 on weekdays and just a morning session on Saturdays. Note the shop is closed on Sundays and Mondays. The reason they are cheap is that the shop will be open while the workshop is in progress and if a customer wants to buy something I will serve them. June Knight knits great gloves! June Knight's soft and stretchy gloves. The camera angle makes one look bigger but they are exactly the same size! To put on the wall as art or to eat? Chocolates from Marks and Spencer. Isn't it good to sit round the table with family and friends and enjoy the conversation? Whether it's the dining table or a coffee table there's usually food and drink involved. And after all those days of extra calories I want to get moving and enjoy lots of winter walks. I'm looking forward to being back in the shop today after the Christmas break. Whether it's quiet or busy it's fun. I'm going to change the window from a Christmas theme to one of ... winter walks! Can you hear it? The call of the sales is luring me to Chichester to see what's on offer. Trouble is I'm too busy to go. I'm always hearing of the super organised who do their next year's Christmas present shopping in the January sales. How do they have any money left to spend in January? I wonder if they spend money they got for Christmas on presents for other people? No doubt some of them do. 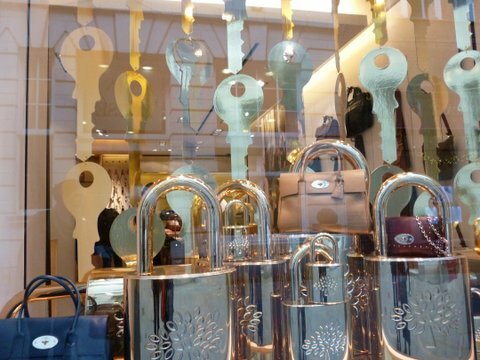 Now that sales seem a year round phenomenon, with many shops going into Sale before Christmas this year, sales don't seem like such a big deal any more. We used to wait for the sales in January and August before buying say a pair of boots or a winter coat but now you can pick up cut price items at any time of year. With the old year passing away and the new one beginning I'm thinking about life. I always used to think that everyone else was achieving more than I was and coping better with everything than I was. Now I realise that everyone has problems and issues. No matter how perfect an individual appears - and there are lots of those 'perfect' individuals in magazines and on the telly - it is all an 'appearance'.No- one can teach you how to live more successfully. Their ideas for making your life work better may not suit your personality. Your own ideas based on what you know about what works for you are the best ones. For example, I know that I procrastinate. I put off til tomorrow what should be done right now. I tell myself 'I'll do that later'. The 'To Do' list is a bad idea for procrastinators like me. Once it's written down in a list there is a great sense of achievement but 'To Do' is a long way from 'Done'! Also a list encourages working at one thing then crossing it off whereas a lot of us can get more done by multi-tasking. I am going to work with what I've got. I know my strengths and my weaknesses and I can use them to help me get where I want to go. I am going to stop beating myself up. I will be kind to myself and enjoy working out how to improve my life my way. Father Christmas always knows just what I want. And there was I thinking maybe I was getting a bit old to still have a stocking this year!! Handmade Happiness will be open on Saturday 29th.Then closed to re-open on Wednesday January 2nd 2013. I hope you're having a wonderful day with members of your family and that Christmas 2012 is being all that you hoped it would be! More tomorrow. Granny is inside the toy shop. Her two grand-daughters have been told to wait outside. Look closer and you will see that favoured grand-daughter is inside the shop with Granny choosing her presents! My mother used to collect dolls' houses and all the little things that went in them. I particularly admire the people. So beautifully made. Check out Granny's coat and hat and the shopkeeper's knitted jersey. It's Christmas Eve babe, as the Pogues sang. I've slung up a Christmas tree. And now I'm going to wrap presents before shop opening time. Enjoy your day if you can!!! ps. Yesterday's post was late but it's there. Scroll down to see it. I made these at work yesterday. Did you think I'd forgotten to write on my blog today? I realise I am 12 hours late but it is still Sunday and no matter what I intend not to miss a day's blogging! I opened the shop from 10 to 4 and I am glad I did. I felt a bit tired but a very kind friend, Roly, came in for a couple of hours this afternoon allowing me to do a bit of Christmas shopping and have a break. Tomorrow(Monday) the shop will be open again from 10 to 4. Can you believe it's already nearly Christmas Eve. It has come round so quickly. How will you spend it? More present shopping and food shopping? I shouldn't say this because it might not work this year but I like going into Waitrose just before closing on Christmas Eve. 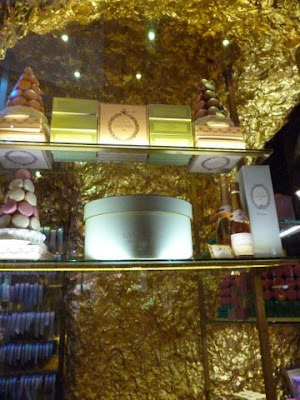 They seem to sell off lots of luxury foods before their two day break and it's a great time for bargains. Yesterday a photographer from the Petersfield Post came round taking photos of all the shop windows for a competion. The idea, or so I thought, was for the readers to select their favourite Christmas window. So imagine my surprise when minutes after the photographer left a lady from the paper came round bearing a prize for Tara Interiors my neighbour. It's not that Tara isn't a worthy winner. She is and her windows look fab. It's just that there was no vote. Tara had a momentous day yesterday. She came into my shop clutching her hand saying she thought she'd cut the tip off her finger with her scissors. Now sharp things and blood I'm not very good with, I have to admit. I managed to pass her open plasters with my eyes averted and then dashed off to Mandy's shop, Wild Damson to find a first aider. Mandy and her first aid box were there in seconds, making a good big bandage on Tara's poor finger. I would have been happier if she'd got it checked at the hospital but that's her decision. I do tend to be a mother hen. Flapping around but not very useful! Last night my three children, their partners and I went to Pizza Express for a meal after a drink at the Black Sheep in Sheep Street. I like the way the Black Sheep is a series of room sets. Sitting rooms with furniture set squarely giving a cosy, homely feel. The kids were laden with Christmas presents. We had a great evening together and Christmas, it felt had really begun! Another pic from the archives! Last night I wanted to take some flowers to a friend's house. But have you noticed that if you don't want a red pointsettia there isn't much else in the shops right now. My idea of luxury would be to have fresh flowers delivered to the house every week. I once nearly achieved this when I worked for Marks and Spencer for a while and staff could buy the out-of-date flowers for £1 a bunch. Then I always had flowers in the house. I think it's the one thing you can do to make a huge difference to the look of a room. Stick a vase of flowers in it and the room comes to life and looks so much better. I took this picture two years ago in Liberty, London. Even a little matchbox would look beautiful wrapped in one of these papers. I remember I was shocked at the price per sheet but aren't they special? Wrapping nicely is part of the joy of gift giving and even if you're not confident the present itself will be just perfect the recipient will enjoy the anticipation of looking at and then unwrapping an attractively packaged something. I must get in early today to make more carrier bags. These run out so quickly. If I had a whole day of making them I could stash away a box full of them for future use. Wanna help? If you want to make a fairy from a 'dolly' peg first paint your peg. Minimum is to add eyes and mouth with felt tip straight on to the peg. Even easier is buying a painted peg from HH with or without wool hair for £3. For this fairy I glued a bit of tinsel to her head then wrapped her body in a bit of pink satin. The ripped fabric was wrapped round her then knotted and tied in a bow to form wings. A long piece of tulle net was then running stitched along a long end and gathered up then knotted to her to form the puffy skirt. Tie a piece of silver thread round her middle to make a hanging thread. Penny Baker's vintage fabric pack £2.50; Michelle Green's sheep £2.50; Kate's Xmas pudding £2.50; star decoration £2.50 and Eileen Brown's heart decoration £3-00. Sometimes I hear someone looking in the window of Handmade Happiness talking to their companion. 'Yes, it's a really nice shop but it's expensive.' Chances are the people who think it's expensive haven't actually been in to see for themselves. I like to have a range of handmade items in every price bracket and you can get a button or a wooden heart for just 25p. Some things are more like the rag rugs and the occasional quilt but months of hard work that have gone into making them so they should be more expensive. To show you that Handmade Happiness is a good place to come for a child and his pocket money to do his Christmas shopping and for anyone wanting bits and pieces at very reasonable prices I'm going to show a selection of what the shop offers in all price ranges starting today with £3 and under - and I didn't include a button or a wooden heart. It's Monday but Handmade Happiness is open all day! Last Friday it must have felt something like the world ending for those poor parents in Connecticut whose children were killed randomly by an idiot with guns. If anyone from that area is reading this I send you my love. Is everyone feeling Christmas pressure? I really respect you if you've got your tree up, sorted out most of your presents and feel on track for the Big Day. If you're like me you're not even quite sure where the artificial tree from last year is. No presents have been bought and the Big Day just represents NO WORK! It's at this time of year that I always wish I'd made more of certain things to sell and from next January (remind me) I will be making through the year for Christmas. During the quiet days of January and February HH will be a little haven of making activity. Come in with your project and we'll all make together. More on that idea later. *This picture was not taken this year! 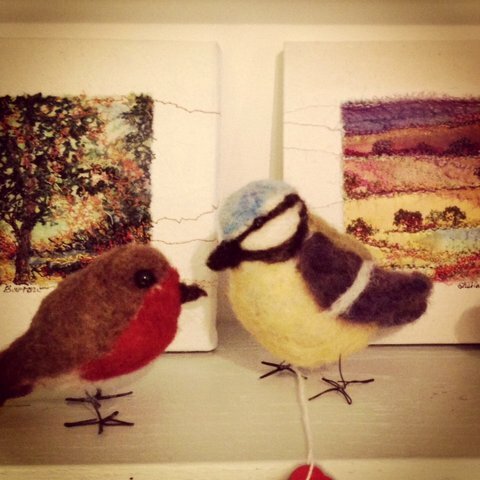 In the shop: Michelle Green's needlefelted birds £20 and £24 with Sheila Barrow's small pictures £38 each. Flicking through the latest Vogue I note that jewellery is virtually absent. Teddy by Lindsey Agostinelli . Patchwork cushions by Pam Dew. Sorry, I'm late writing this post this morning. It's lovely having Amy to stay but once we start talking time disappears! She took this picture in the shop yesterday and she set up a Handmade Happiness Facebook page for me which I'll try and put a link to. It was lovely yesterday to make necklaces at home knowing Amy was looking after the shop. Three turned oak candlesticks by Peter Skrzypczak. The utterly realistic led candles are included. My daughter Amy will be in the shop today and tomorrow so I can get on with some making at home. I found this gorgeous way of wrapping on Pinterest. It's fun to find pretty pictures online. It hasn't occurred to me before now that puting up a selection of pictures that you find appealing on Pinterest is also a great way of publicising your business as each picture could lead to someone new visiting your blog/website. Yesterday a customer urged me to get a business Facebook page. I'm not a member of Facebook personally but Handmade Happiness should have its own page of pictures and news! Also pinterest and Facebook and blog/website can all link back and forth to each other. A three pronged publicity drive!! By the way if you click onto romancing the home above please don't come away with the idea that any of the pictures were taken in my home. They were not. Dyed blanket stocking made by me with one of Lindsey Agostinelli's mohair teddy bears. I am reading an interesting book called 'Build a business from your kitchen table' written by the two women who set up notonthehighstreet.com Based on their own experiences of building up an idea into a multi-million pound business I am hoping the book will answer some of the questions I posed in yesterday's post below! Will let you know. I may have used this picture before... still love it. Carluccio's Christmassy boxes of panettone. When you make things to sell you want to get a fair price for them. You want people to know that you and your products exist. And you want to be able to justify doing what you love - making things - to your nearest and dearest when sometimes you are not earning much money. Before the shop my most successful time financially was when I had an agent selling my products for me. She won me really big orders but on the downside I then had to make hundreds of the same items which made me feel like a machine but at the time it seemed worthwhile. Customers regularly say things like,'Of course you can't charge for the time it takes to make things.' There seems to be a misconception out there that makers don't need to make money!! Certainly there are hundreds of talented people who are forced to stop doing what they really want to do - make things - to work full time for someone else in order to make a reliable income. It's a shame. I've talked before about high prices for stands at the big fairs. If fairs want to show off the handmade in the UK products the customer is looking for they have to help good designer/makers by offering them cheap/free stands. Sheila Barrow's dyed silk velvet scarves. Apologies for the poor photography this morning. The scarves are going over the edge of a table in case you are wondering. I think these colours are heaven. A bit of luxury for the dark cold days of winter! Yesterday was busy in the shop, especially in the afternoon. Getting presents is quite a responsibility isn't it? Wanting so much to get it right and have your gift cherished, not despised. People also want to give surprises and that can be even more difficult. My job as a shopkeeper should be to make the choosing as easy and pleasant as possible. My daughter Amy suggests displaying a big Christmas present tick list with Granny, Husband, Son, Daughter etc. written on together with a suggested present nearby tied with a big label 'For son' etc. I think this is an excellent idea. I find myself automatically gift wrapping every purchase. First with Christmas tissue, then put in a Christmas paper bag. Customers like this and it's satisfying for me to do the best job I can for them. I did think previously that I'd offer a gift wrap service this year and charge something for gift wrapping with ribbons and decoration over nice Christmas gift wrap but I've realised that there's no time for that. If I employed an assistant I would be able to do such things but at the moment I'm quite busy enough serving customers. And that's just how I like it! Yesterday my friend Sue and her daughter kindly helped HH to a whole new look by shifting furniture and stock around to make the most of the new things that have come into the shop this week. Sheila Barrow bought in the most fabulous silk velvet scarves she has dyed in amazing colours, together with clutch bags and evening bags with detachable handles made of the same dyed velvets. Excellent Christmas presents for some lucky ladies! Come and have a look! Customers yesterday said these look like sea anemones. There is something softly organic about them. They look brilliant pinned to a coat collar or jacket and the colours remind you of where they are made among the heather, grey sea and pale sand of Westray. Handmade Happiness also has scarves, bags and wrist warmers in the same soft colours. Yesterday I painted the wood coat stand in the lobby a Little Green shade called 'Celestial Blue'. Today it will hopefully look perfect carrying the lovely new stock. But these beauties will stay pinned to the big linen board where customers can admire them best and select their favourite colours. White mood board by Jenny Stacy. Are you keeping warm? I had to keep the shop doors closed all day yesterday. Perhaps due to the weather a parcel arrived at 5pm and it had been posted on Saturday first class. The postman said it was the busiest week for parcels ever due to internet orders for Christmas. I am really excited to get this parcel. It is from sisters Lizza and Jenna who live on Westray in the Orkneys. They went off to art school and then returned home to design and make knitwear. The first time I saw their stand at the Country Living fair in London I was bowled over by the prettiness of their colours and by their imaginative designs. Years before that I saw them at the Chelsea Craft Fair. Now I am thrilled to be selling their work in my shop. I'll take some pictures today to show you tomorrow. Yesterday these soft and warm gloves were brought into the shop by June Knight's daughter. The knitting skill is superb and I am pleased to be able to offer them to Handmade Happiness customers for £28 a pair. I have a feeling they are going to sell very quickly. My daughter Amy popped in to the shop on a surprise visit yesterday. It is so good to see her with all her ideas and suggestions. She is a clear thinker and has far more knowledge on the running of shops than I have and thanks to her I'm going to make a few changes. It feels like I've been given my school report all over again. Good but could do better!! Paperwork took longer than expected yesterday and I didn't catch the train for Guildford until nearly 3pm. Once there I headed for tkmax where I hoped to find a pair of shoes but although there was a wide choice in size 7 and size 3 not a lot in a size 5/6. I wasn't tempted to buy anything else though I did a lot of looking. Is it just me or does everyone get a lot more fussy as they get older? I won't buy anything unless it is exactly right and I seem to rarely see anything that is. The exception being in a shop with the initials HH!! So the quest for the fresh and new continues. I wonder what today will bring? First I need to make more carrier bags, clean the shop windows and re-arrange the stock. I've also got to work out where to put up fairy lights. Nothing gives a magical atmosphere better than fairy lights...! Christmas goodies in Carluccio's at Fenwicks, London. If you had to choose just one meal to eat daily for the rest of your life what would it be? 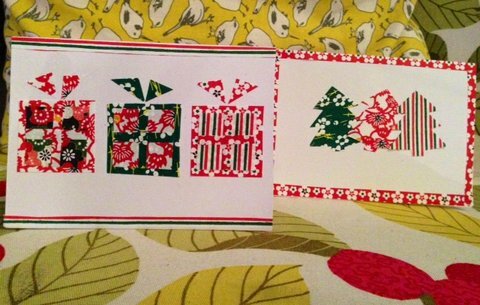 This year my daughter Amy has been inspired to cut out origami papers to make Christmas cards. I am selling them in Handmade Happiness for £3 each. Judith Needham's reindeer. £6 each. Judith Needham makes baskets and playhouses from willow. Her reindeer have got heaps of personality! Eileen Brown's ceramic shoes. A-maz-ing! Vessels the colour of the sea by Roly Phillips; dragonfly by Eileen Brown; sea glass by Molly Smith and scarf by Rita Stamp. When you compare the texture of the shoes with the ultra mat look of Roly's pots you can see the versatility of clay. With people bringing in fresh work nearly every day at the moment there is much to wonder at in Handmade Happiness. I woke too early today and wrote an advent plan. If I manage to make what I plan to make in the shop today you'll see Day One tomorrow!! Looking in to Handmade Happiness at night. A less blurry picture taken before the white tree was installed. The shop's mobile radiator was going at full blast yesterday. What a cold day! It looks like I was shivering when I took the top picture! Keep warm and enjoy your day! 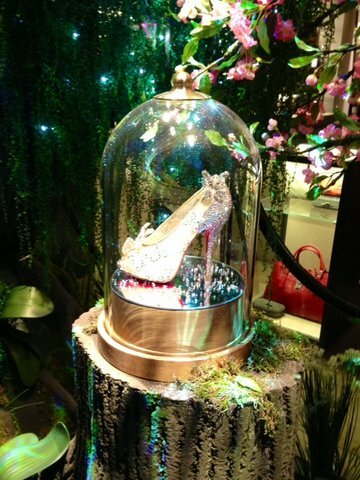 A Christian Laboutin shoe in Harrods window. More eye candy for you. Is this the kind of thing you like to see on a blog? When I look at other peoples' blogs I hope to see something inspiring in either the text or the picture. Something that makes me think. Something to make me go, 'Wow!' On a blog that doesn't receive comments it is hard to ascertain what people want to read and see. Advent calendar made by Pam Dew in Handmade Happiness. Yesterday on my day off I did some of the jobs that accumulate when you can't get to them during the week. I chose photos for and ordered 400 new little business cards. I enjoyed a visit to the library where I found 'Art in Felt and Stitch' by Moy Mackay which looks wonderfully inspiring and 'Vogue on Alexander McQueen'. Both are brand new books. Also 'Don't let's go to the dogs tonight' memories of a childhood in Africa by Alexandra Fuller. A fascinating read. I shopped, that is I did the charity run but found nothing. I did find a really good gold felt tip in the art shop which will be useful for Christmas card making and some heavenly gold tissue paper with red,pink and orange flowers on by Caspari. And I looked at a website www.damsonandslate.co.uk which promotes Welsh handmade beautifully. Damson and Slate is a bricks and mortar shop owned by Hilary Lowe, an interiors stylist. I am full of admiration and feel a bit small in comparison. I think 'jobs' is the wrong word. A good 'job' on my day off would have been to spring clean the house. It needs it. The 'jobs' I chose were a lot more fun! Robin tree decorations, seasonal toast racks, owl mugs for children and ballerinas are among the delectable new stock Kate brought in to Handmade Happiness last week. What a nice new baby gift. I like the cushion behind them too. The softest little slippers, mittens and hats by Samantha Holmes. When in London I like to look for nice gift wrapping paper. I rarely find anything I like and this year the selection of Christmas gift wrap has been particularly dull I think. So while looking at stationery (behind the escalator in the picture above) we happened upon the gorgeous baby things in the pictures above. When I am a granny I will want the adored baby to have lovely things. I kidded my daughter that when that time happens I may have to re-mortgage my house as I will love choosing and buying gifts like these!! For handknit inspiration for babies do look at the pictures on the blog Posie gets cosy.Such nice baby clothes! Congratulations to Ruby and family on the birth of baby Mickey. Pretty 'scraps' packaged by Penny Baker. This is the time of year when things sell out fast. Last night all of my Santa's hat decorations were bought, Kate Hackett's ceramic little decorations are fast disappearing and I have very few of the vintage scrap packs pictured above left. Yesterday I re-did the window display vertically. I was fed up with my horizontal 'washing line' approach and think it looks fresher and better now. Today I plan to be at the shop early to sort out the carnage I left last night and to make carrier bags ready for the day ahead.